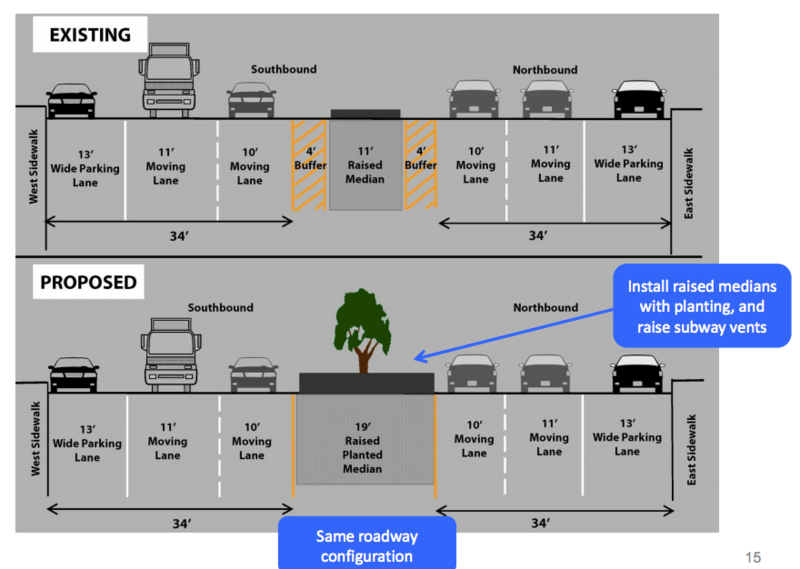 Last week Streetsblog Denver reported on changes coming to 16th and Broadway that will improve safety at a dangerous intersection. The project is worthwhile, but at just over $1.1 million, it’s not exactly cheap for a one-block fix. While redesigning surface streets will always be much cheaper than building highways or parking, some methods are more cost-effective than others. The Hancock Administration and the Department of Public Works will be able to get more bang for their buck if they learn from what other cities are doing to make streets safer, faster. New York City has been a leader in this regard, phasing in projects by starting off with low-cost materials and quick implementation, then moving on to more permanent materials after the initial redesign demonstrates success. It’s a method that’s starting to take hold in several cities. In 2012, for instance, New York City DOT transformed 50 blocks of Fourth Avenue in Brooklyn’s Sunset Park neighborhood using paint, epoxy, and gravel. Pedestrian injuries dropped 29 percent following the redesign. Soon the city extended the same design to Fourth Avenue in Park Slope, where injuries declined by 61 percent. 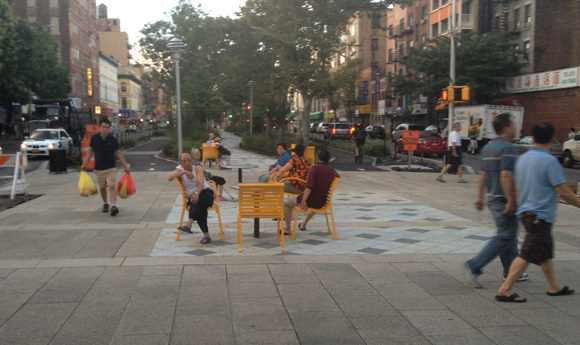 Its success, Streetsblog New York’s Stephen Miller reports, will ensure the road diet becomes concrete — literally. These projects weren’t capital projects, but less invasive ones that don’t require cutting up streets. Enhancing safety with paint, planters, trees, and gravel cost hundreds of thousands of dollars per mile — peanuts compared to car infrastructure. Planners in Austin, Texas, calculated that on-street bike facilities cost $50,000 to $500,000 per mile, for example, compared with $22 million per mile to build a four-lane arterial road [PDF]. DPW knows how to make its dollars go further. Denver’s premiere bike facility, the 15th Street protected bike lane, cost just $155,000. But so far, projects like that are the exception here, not the rule. Rather than waiting to build projects with expensive materials, Denver could start out with inexpensive versions. Not only will this bring the construction timetable from years down to months, it will make street redesigns — scary ideas for risk-averse city agencies — less daunting. That in turn will generate momentum to permanently overhaul more streets.